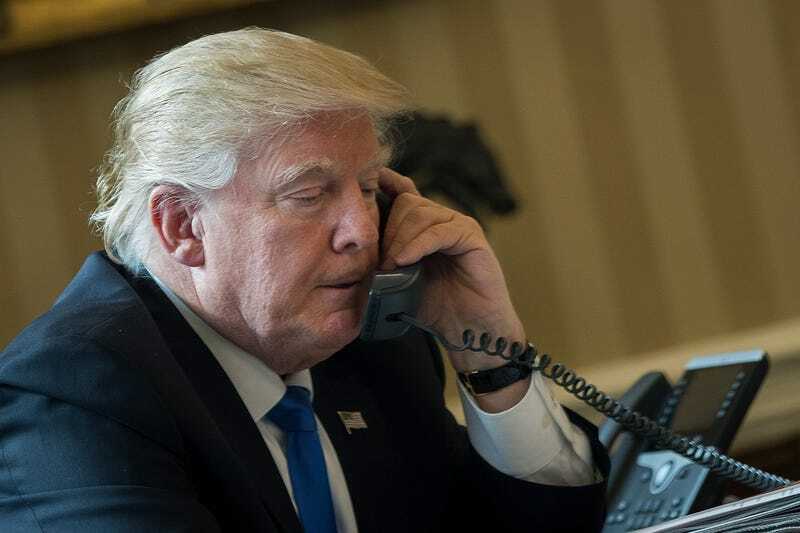 President Donald Trump speaks on the phone with Russian President Vladimir Putin in the Oval Office of the White House on Jan. 28, 2017, in Washington, D.C.
Russian President Vladimir Putin doesn’t know that admitting that he talks to President Donald Trump on the regular probably isn’t a good thing, considering that the Trump administration is currently being investigated for Russian collusion in the 2016 election. But that’s exactly what the Russian leader did Tuesday. During an interview with an Austrian news outlet, Putin calmly noted that he talks with his play cousin, Trump, so much that the two might as well have a shared cellphone plan. After being asked about his relationship with Trump, considering, oh, I don’t know, the permeating stench of Russia sauce coming off the Trump administration and “special counsel Robert Mueller’s February indictment of 13 Russians and three Russian organizations,” CNBC reports, Putin didn’t miss a beat. Don’t all the Trump loyalists find this upsetting? Because, you know, America! Of course they don’t, because the president is still a xenophobic, racist trash can who fills his piehole with trash chicken. No respectable person with any kind of decent palate eats KFC. Feel free to @ me. Nevertheless, neither the White House nor the Russian Embassy has responded to CNBC’s request for comment, I guess because both administrations assumed, when they purchased the burner phones, that there was an understanding that it should never be mentioned. The White House website claims that the two presidents have spoken a total of eight times, but the Maury test has determined that this is a lie. Probably didn’t help matters that during Trump’s unhinged Friday-morning rant, he claimed that Russia should be at the G-7 meeting, which was called the G-8 until Russia got the boot for the annexation of Crimea.